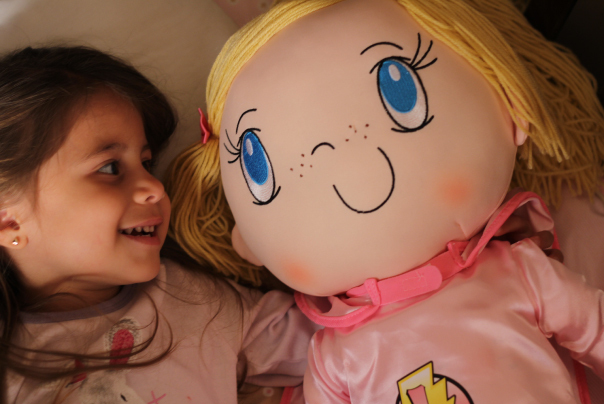 My Friend Huggles dolls are large, life-sized dolls for toddlers and primary aged kids. Each doll is themed with a character value and has an inspirational teaching message on it’s large back tag. 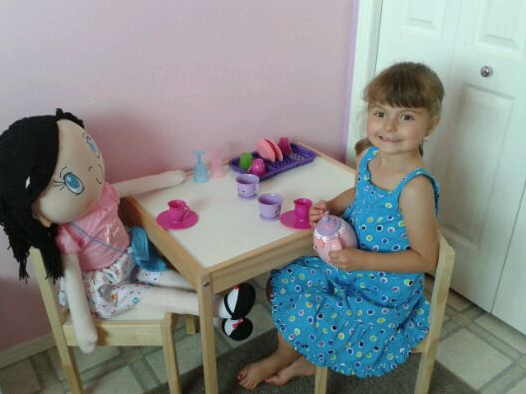 Our newest dolls are twins and together they battle bulling, Myles with Courage and Mimi with Confidence. The Best Thing About Being Four ~ Adorable video of an outdoor birthday party with My Friend Huggles dolls. 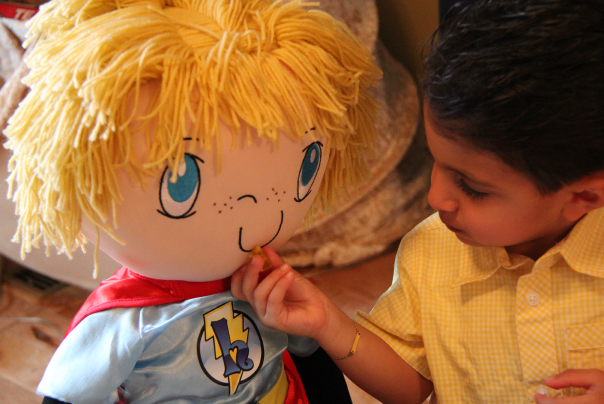 My Friend Huggles dolls are themed to teach young children character values. 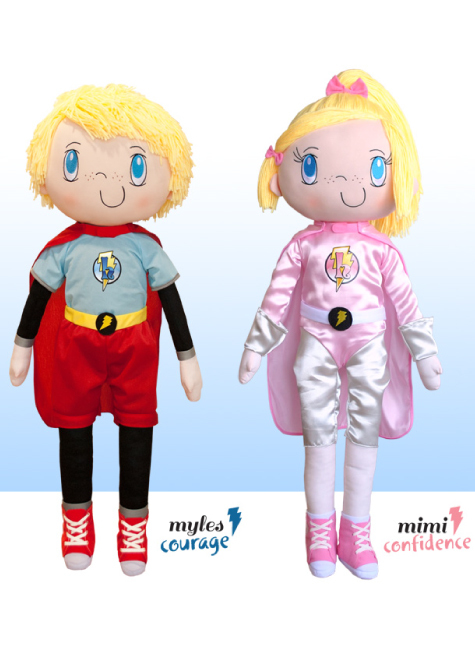 My Friend Huggles Myles teaches Courage and Mini teaches Confidence. My Friend Huggles went live on TSN Radio 990 to talk about their Campaign of Hope inspired by a 5 year-old boy with Acute Lymphoblastic Leukemia. 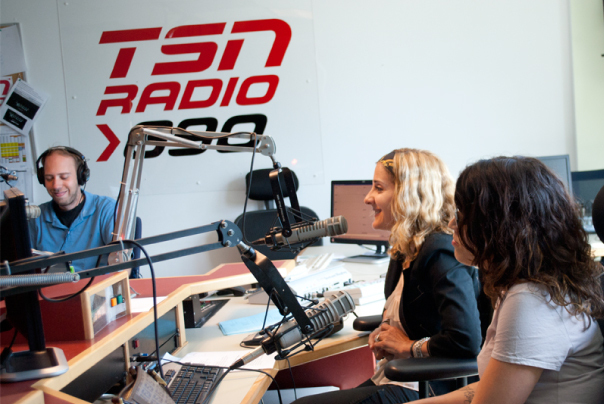 Earlier this month My Friend Huggles went live on TSN Radio 990 with five-year-old Liam Armstrong’s Mom (Jackie) to talk about their Campaign of Hope. My Friend Huggles Campaign of Hope is a campaign to gift 1000 My Friend Huggles dolls to Starlight Children’s Foundation, who will distribute them nation-wide to children’s hospitals. Host John Bartlett (the Voice of the Montreal Canadians) chatted with My Friend Huggles for a 30 minute interview about Huggles, their gifting to Children’s Hospitals, their connection to Starlight Children’s Foundation and Strangers In The Night 2013, which kicked-off The Campaign of Hope. Inspiration for this campaign came from Liam Armstrong, who was diagnosed with ALL (Acute Lymphoblastic Leukemia) in January 2010. With ALL, malignant, immature white blood cells continuously multiply and are overproduced in the bone marrow. To fight this, Liam has had to endure countless obstacles. What is inspirational about this little boy is that he has manages to laugh and smile through it all. My Friend Huggles saw this firsthand when company president Brenda Katz visited Liam and his Mom in the hospital this past December. My Friend Huggles was so moved by this courageous little boy and by his attachment to the doll that was gifted to him during the visit that soon after, plans for a campaign to gift more My Friend Huggles dolls was in the works. 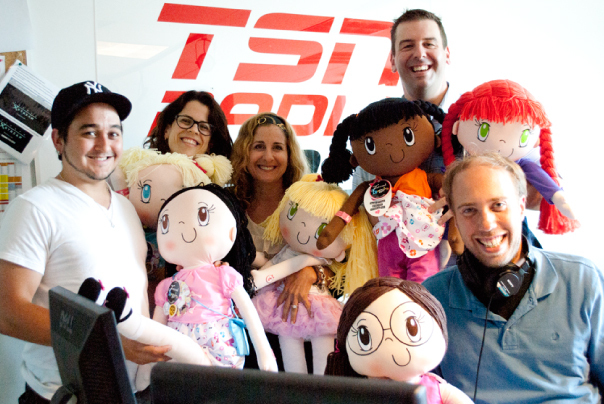 To involve the local community in their campaign, My Friend Huggles brought 5 dolls to gift to the first 5 people who called into the TSN Radio 990 station, then, they went a step further and donated 5 dolls on behalf of each caller! 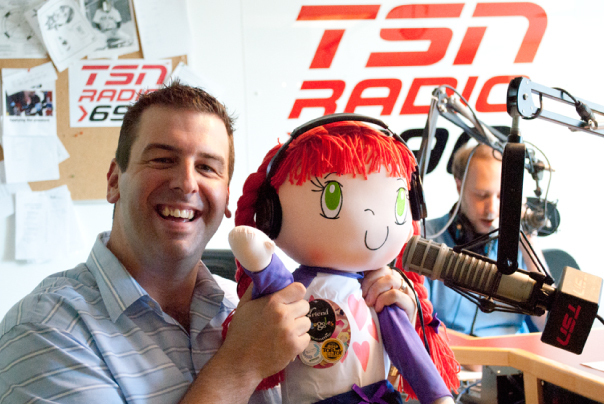 Host, John Bartlett was so supportive he purchased a Mia doll for his niece. All of us at My Friend Huggles had a fantastic time and we can’t thank the staff of TSN Radio 990 enough for such a fun visit! Shriners Hospital for Children – Using My Friend Huggles dolls to teach the scary process of operation and what a young child will expect. Shriners Hospital for Children — Canada, located in Montreal-Québec, provides world-class care to children from across Canada. They treat children with a host of orthopaedic and neuromusculoskeletal disorders in a family-focused environment that puts children at ease. Every member of their staff, from surgeons to therapists, nurses to orthotists, are committed to helping children improve their quality of life and achieve as much independence as possible. If your child needs to have an operation, there will be plenty of questions, concerns and fears on their part. At Shriners Hospital for Children they will be working with donated My Friend Huggles dolls to demonstrate procedures by using the large dolls as an aid to explain the scary process of operation and what a child will expect. With operations, your child’s age and developmental level play an important part in what they will deem scary but we hope having a happy, friendly-faced My Friend Huggles doll to aid in the process of explanation, their fears will be lessoned. Kids at Shriners Hospital for Children were the first recipients of the “Huggle it Forward Campaign of Hope” where every doll My Friend Huggles sold at Strangers In The Night 9 (a unique charity gourmet gala to benefit Starlight Children’s Foundation Québec), a second was gifted to a child in need.